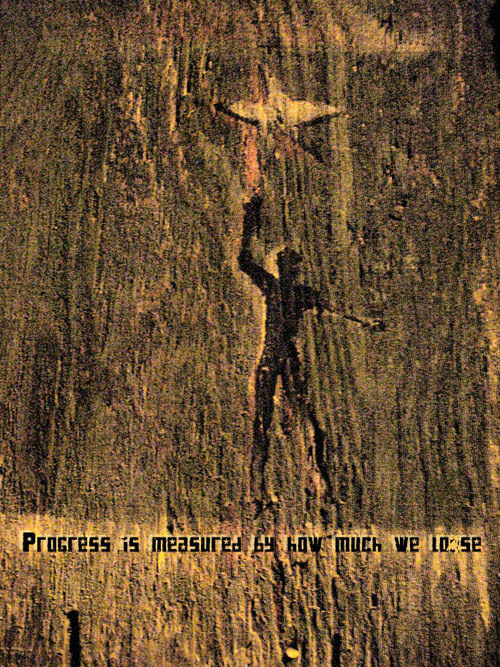 “Progress is measured by how much we lose” was originally the name of the radio show the Peter “the homeless guy” would do after our Lounge World show at 6am Sunday mornings on CFUV FM102 (UVic)… It was truely a show like no other… I wish I had tapes of it. Stream of consciousness ramblings and old 78’s played off of a portable record player that he mic’d… liked to use his own gear. Anyways… Peter had a way of blowing minds, and probably had a greater effect on those he encountered than he realized. At least to those who’d listen to him. Wisdom in an insane world is a great burden, I think.